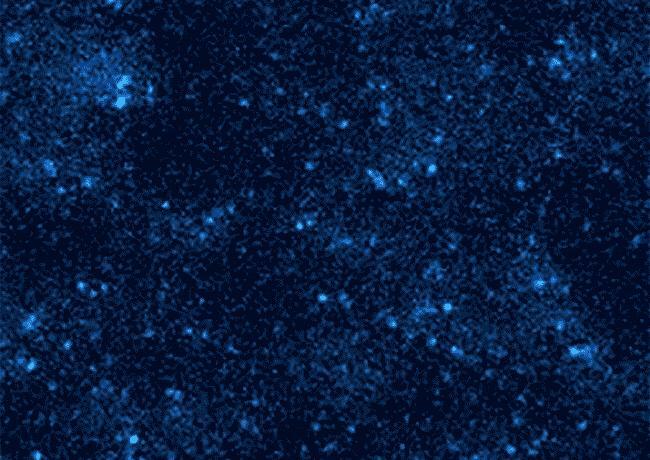 DURHAM, N.C. — An imaging technique developed at Duke University could make it possible to peer inside cells and watch dozens of different molecules in action at once — by labeling them with short strands of light-up DNA that blink on and off with their own unique rhythm. When attached to cells or other objects and observed for enough time, these barcodes could be used to detect and tell apart any number of things at the molecular scale — including particular proteins hidden among the tens of thousands the human body needs to function and grow. Working with Duke computer science professor John Reif and postdoctoral researcher Abhishek Dubey of Oak Ridge National Laboratory, the team’s approach increases the number of different signals it’s possible to distinguish with a single dye color. But rather than rely on multiple DNA sequences like previous single-color methods, they keep the sequence of the free-floating strand the same and instead tweak things like the length or number of repeating sequences on the strand attached to the molecule of interest. This lets them produce flashes with different frequencies, durations and brightness. In a paper published online April 5 in the journal ACS Synthetic Biology, computer simulations suggest it’s theoretically possible to distinguish as many as 56 different molecules simultaneously, each blinking on and off in the same color. And if multiple dye colors are used that number balloons to thousands. The researchers say their technique is also able to do so at a fraction of the cost of other methods, and without fading under the glare of the microscope over time. In a companion paper published March 21 in the journal Nano Letters, the team also tested their approach in the lab. Shah and Reif designed seven different DNA devices, attached them to a glass surface, and imaged them using fluorescence microscopy. With less than an hour’s worth of data they were able to use each device’s distinct blinking behavior to distinguish them. The researchers will present their approach at the 16th Conference on Foundations of Nanoscience (FNANO19) in Snowbird, Utah, on April 15. This work was supported by National Science Foundation Grants CCF-1813805 and CCF1617791.